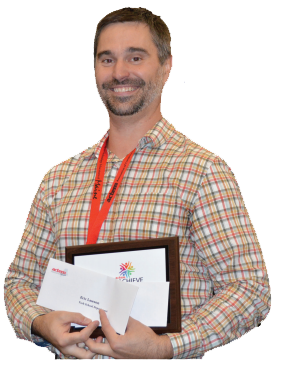 Eric Lawson of the York School Department was recognized at the recent ACTEM conference as our 2018 ACHIEVE award winner. Eric Lawson has been in education for 18 years. He has been an elementary teacher, a technology integrator, an Admin Curriculum/Technology Integrator, and is currently the Director of Technology & Libraries for the York School Department in York, Maine. He has been published in eSchool News, Tech&Learning Magazine and ISTE’s Learning and Leading with Technology Magazine for technology integrated projects and ideas. He was named a member of the Maine Starting 6, and was inducted into the Unum Maine Teacher’s Hall of Fame in January 2012. He was the ACTEM Achieve Award winner in 2018. Eric is a certified Google Innovator, Trainer and Top Contributor. He presents at conferences, and consults with schools making the move towards GSuite for Education all over the country. He lives in southern Maine with his wife, Jennie, two daughters, Elsa and Lily, and golden retriever, Surrey.